So much for November 11th being the biggest Android day in recent memory? It appears to have been replaced with the 18th according to reports out of Verizon’s camp this morning and now Best Buy. 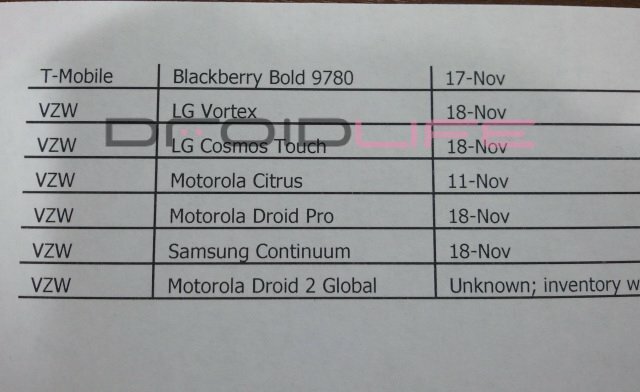 The Droid Pro, Samsung Continuum and LG Vortex will all hit BB stores shelves on the 18th with possible pre-orders the week before. Does this mean the Continuum won’t hit Verizon stores on the 11th? Like we said earlier, release dates for phones change almost hourly, so don’t be surprised if you see these adjust another time. Just expect a whole batch of Android devices on every level to launch over the next 3 weeks. It’s going to be one wild ride. Oh, we should also point out that the Droid 2 Global is listed as “unknown” but we’re pretty sure it’s still on track for November 11th. Check out this comparison chart for the D2 Global to be in the know.